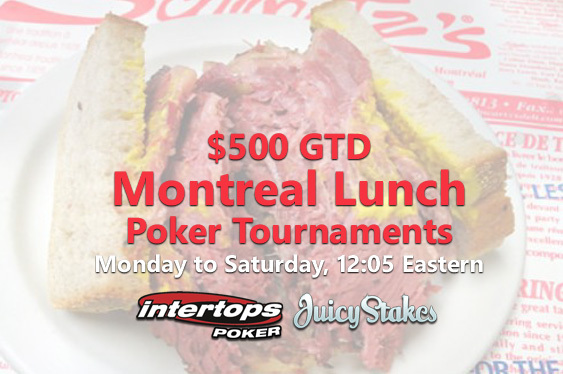 Now that Intertops Poker and Juicy Stakes Casino are hosting a $500 GTD Montreal Lunch poker tournaments every Monday to Saturday at lunchtime Eastern time, smoked meat on rye with a side of poker could become a new tradition in the unique Canadian city. Buy-in is only $8 for the new online poker tournaments. The game is no-limit Texas Hold’em. You'll get 3000 starting chips. Blind levels are 10 minutes. Re-buys and add-ons are available. Montreal, the second largest French-speaking city in the world and home of the NHL’s Montreal Canadiens, is known for its cosmopolitan style and unique French-Canadian food. To get the week started, this week there’s also a $200 GTD Get-Up-and-Go tournament Monday at 6:10 pm Eastern. It’s a turbo/knock-out tournament; there won’t be any re-buys or add-ons. Register for Montreal Lunch and Get-Up-and-Go tournaments under the Tournaments tab in the poker software.